Advantages: High quality casting; accurate; useful subject (common configuration for many late-war Bf 109 G-10s); very easy conversion. Disadvantages: Small amount of resin shrinkage on wings; might have been nice if separate slats and flaps were offered. A welcome conversion for Messerschmitt Bf 109 fans. The Revell Messerschmitt Bf 109 G-10 remains a great little kit more than 30 years after its release. It is simple to build, it features nicely recessed surface detail, and the outline is actually more accurate than the much more recent and more expensive Hasegawa kit. I built one of these kits in the last month or so. In the end, I could not finish the model in my preferred marking option because references indicated that this Bf 109 G-10 was fitted with the narrow main wheels and small bulges on the top of the wing; plus the long tail wheel. This was a fairly common configuration for the Bf 109 G-10, but the kit supplies the large bulges moulded onto the upper wing, and the short tail wheel with a canvas dust cover moulded in place. Murphy's Law being what it is, almost before the glue had dried on my Bf 109 G-10, I received Loon Models' 1/48 scale Messerschmitt Bf 109 G-10 Wing With Small Bulges, Wheels and Tall Tailwheel. This supremely simple conversion comprises just five parts in cream coloured resin - two upper wing halves, two replacement narrow main wheels and a tail wheel unit with integrated tall strut. Moulding quality is very good indeed. The wings have been taped to a stout piece of cardboard to reduce the chances of warpage. It has worked in this case. Loon Models has not just plonked a bulge on the top of the wing. They have also hollowed out the area underneath for an authentically recessed wheel well. This is a very nice touch. 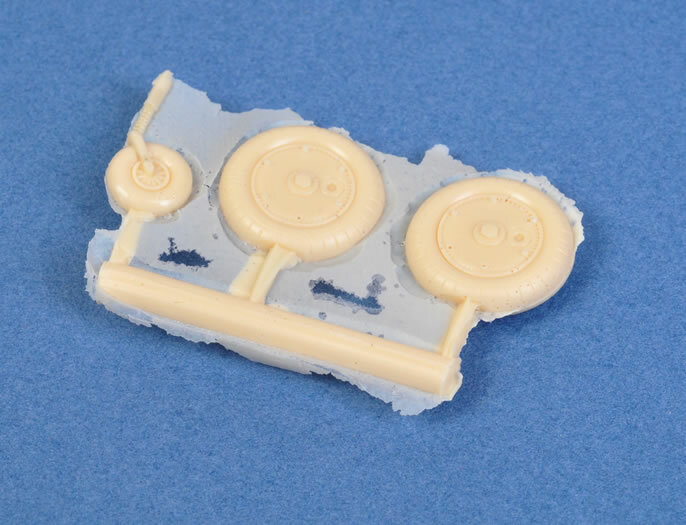 The wheels are cast to a thin connector and a resin sprue. Removal will be a snip - literally. There is a fair bit of fine, feather like resin flash but this will be very easy to clean up prior to assembly. The upper wing halves feature the small kidney-shaped wheel bulge. 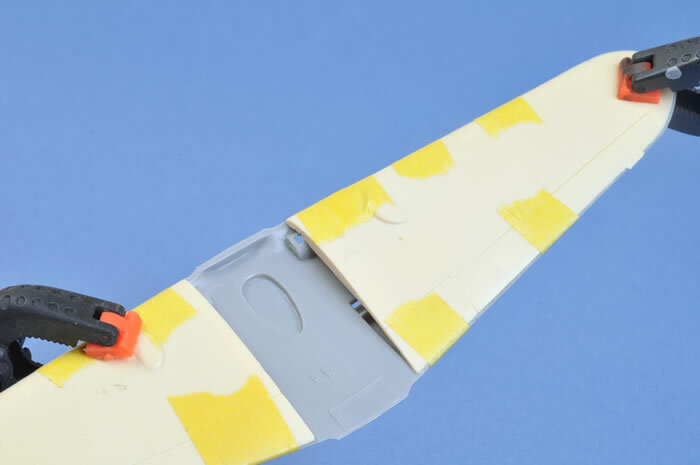 The slats, ailerons and flaps are cast in the neutral postions. 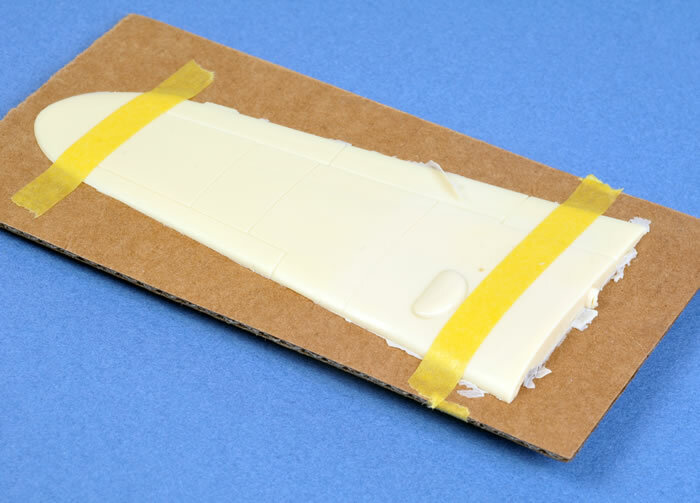 It will be a very simple matter to simply substitute the wing halves for the kit parts. Likewise, the narrow main wheels are a straight swap for the kit parts. The integrated kit tail wheel will have to be cut off and the rear fuselage drilled to install the new tall tail wheel unit. Being such a simple conversion, I decided to prepare and fit the wing straight away. 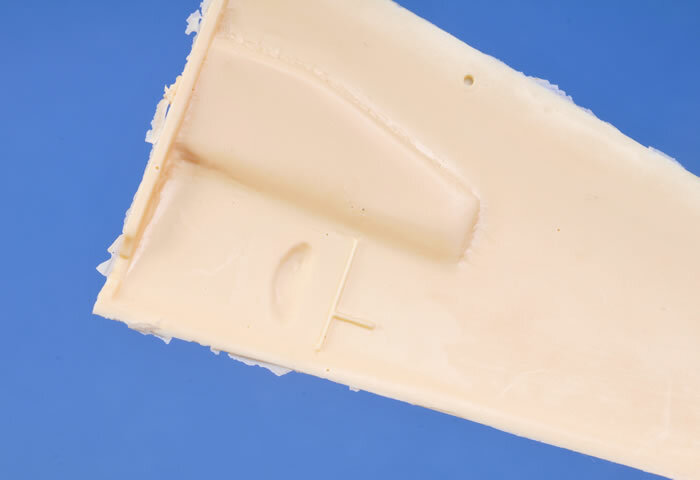 A pour stub on the wing root mating surface of each wing must first be carved away, followed by cleanup of the fine resin waste on the leading and trailing edges. Test fitting suggested that the resin on my sample had shrunk a tiny amount, meaning that the top of the wing was a fraction of a millimetre shorter than the bottom wing at the trailing edge. This tiny discrepancy also meant that the locating hole at the back of the upper resin wing would not mate with the corresponding pin on the bottom wing. The simple answer was to cut off the plastic pin. The top of the plastic wheel well walls also interfered with the fit of the leading edge of the resin upper wing. The front of the rounded sidewalls were scraped down slightly with a hobby knife until there was no gap at the leading edge. 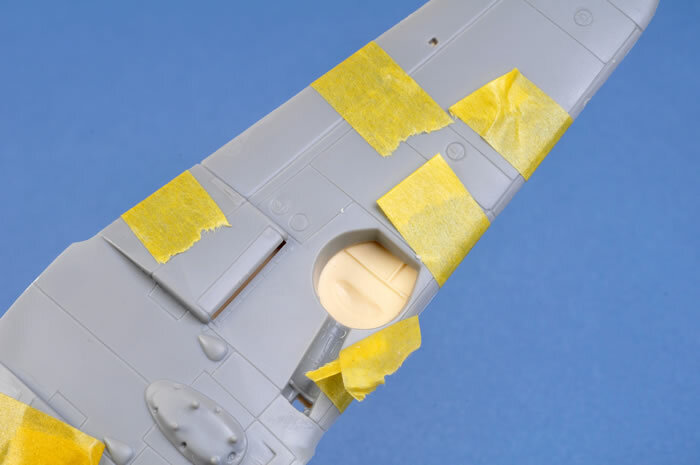 With the resin and plastic parts suitably prepared, the top wing halves were attached to the bottom with super glue. The bulge recesses in the wheel wells look great - much better than the corresponding area on the Hasegawa kit. I will deal with the trailing edge underbite with a thin roll of Milliput when I eventually finish this model. 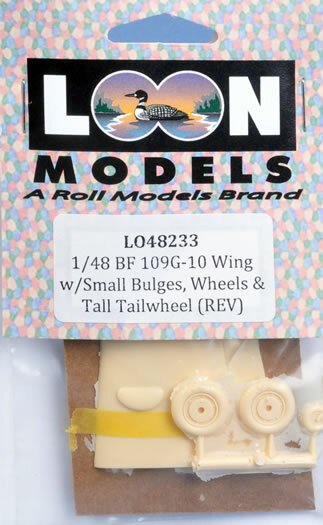 Loon's new small-bulge wing conversion for Revell's Bf 109 G-10 is a great idea for a kit that still has a lot of life left in it. Casting quality is very good and installtion is really quite simple. Well done Roll Models. Now how about the same thing with dropped flaps and leading edge slats in 1/48 scale too?